Whilst traditionally fundamental life processes are studied at whole organism level (in vivo), in recent years for economic, ethical and legal reasons, there has been much emphasis on the use of cells, tissues or organs which are grown outside the body in plastic dishes or flasks (in vitro). Population growth, industrialisation and increasing consumer demands continue to cause environmental stress on living systems with many contaminants finding their way into the aquatic environment, causing an increase in many diseases and impacting on wild species. To assess the potential detrimental impact of such contaminants international law requires chemicals/consumer products to be tested on animals. While advances have been made to reduce the number of animals used in biomedical research, the use of fish is still required for assessing the potential toxic effects of contaminants (ecotoxicology). An alternative to whole animal usage? The use of cell or tissue-based models has been proposed for fish-based studies, with the benefit of requiring only a few donor animals. It is however not clear how well these models could predict the responses that are seen when using whole animals. There is therefore reluctance to accept these as a real alternative. The conventional suspension or single layer in vitro culture models also suffer from drawbacks, (e.g. they live for a short period in the laboratory, and some functions just do not work outside of the animal) making them unsuitable for long term studies. The following infographic shows the reduction in the number of fish used when in vivo testing is replaced with in vitro methods. A single fish can potentially supply enough tissue for many in vitro tests. In response to this problem we have developed a specialised culture from the liver cells of fish that mimic the responses of tissues in whole fish. These ball like structures called 'spheroids' live ten times longer than the existing single layer (monolayer) cells. We have demonstrated that they are able to take-up and metabolise chemicals in a way that is directly comparable to whole fish, suggesting that they could be used as a real alternative to whole animal usage. These spheroid cells are prepared from only a handful of animals, as opposed to hundreds of animals typically needed to study biomedical procedures and to assess toxicity. Their small sizes mean that less material and smaller facilitates are required, reducing the cost of research. Billions of cells can be harvested from a single fish leading to far fewer fish being used in research. Those that are will not be used directly in experiments, only their tissues harvested after sacrifice. We aim to progress this model, using the state-of-art technologies to test the hypothesis that a combination of co-cultures (i.e. different cell types grown together) containing different cell or tissue types of fish (viz. gill, gut and liver) represents an effective alternative model to live fish studies, thus creating a 'virtual fish' alternative. This requires establishment of key biological responses at cellular or molecular levels called 'biomarkers', which are already well established in diagnosis, prognosis and treatments of a range of human diseases. Using these biomarkers, we aim to elucidate the mechanisms and physiological functions by which fish respond to such stresses including following chronic exposures to environmentally relevant chemicals. We then aim to make robust comparisons to assess whether the model is sensitive enough to be considered as an appropriate replacement to whole fish studies. The proposal also aims to build strong links between industry, academia and stake holders, both nationally and internationally to share the knowledge base as well as to potentially gain wider regulatory approval as 'real' alternatives to animal tests to continue our commitment to supporting the 3R's (Reduction, Refinement & Replacement) initiative. 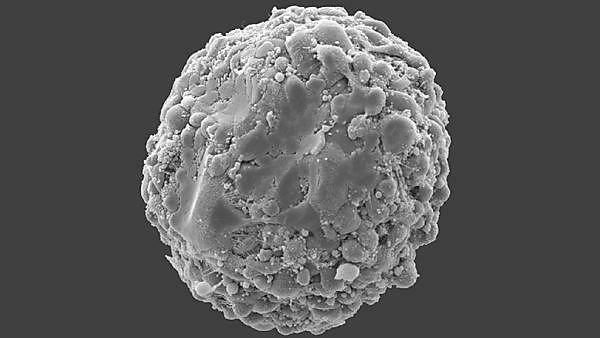 An example Scanning Electron Microscopy (SEM) of a gut spheroid. The following PDF posters contain more detailed information on the virtual fish project. 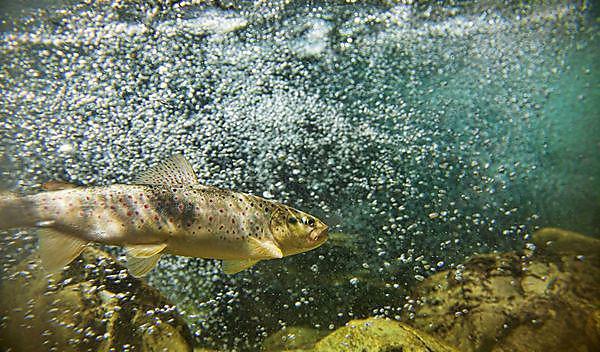 The project aims to probe the primary hypothesis that a co-culture of 3D in vitro cultures from rainbow trout can represent an effective alternative model to live fish studies. 1. Fully characterise the system and further define the culture conditions to ensure basic functionality is maintained and viability is prolonged. 2. Establish baseline values and compare key proteomic and recognised molecular biomarkers in in vitro preparations and compare the values with available in vivo data. 3. Conduct a limited set of in vivo studies to provide material directly relevant to and from the same genetic stock as the cells used in vitro in order to confirm the comparability from in vivo to in vitro. 4. Determine the functionality of spheroids alone or as co-cultures with respect to basic bio-transformation pathways and metabolite formation following exposures to different chemical agents, (e.g. reference genotoxic chemicals: polycyclic aromatic hydrocarbons; environmentally relevant pharmaceuticals: non-steroidal anti-inflammatory, beta-blocker and selective serotonin re-uptake inhibitors; and environmentally relevant metals: copper). 5. Compare the comparative physiology (oxygen uptake, bio-energetics, metabolism and excretion rates) of the systems in response to 'normal' control conditions and exposure to environmentally relevant chemicals. 6. Evaluate 'mixture' toxicity from a 'toxicogenomic' perspective in both isolated tissue preparations and co-cultures. 7. Measure the bioconcentration of selected chemicals in all tissue types following chronic exposure to test chemicals using cutting edge analytical techniques. 8. Communicate the methodologies and findings to key industrial, academic and stakeholder groups. We recently hosted a workshop entitled “Current trends in fish in vitro toxicology: applications of 3Rs principles” on Wednesday 10 May during 27th Annual Meeting of SETAC in Brussels. This workshop highlighted the current trends in fish in vitro toxicology, especially with respect to new and emerging tools, which may benefit the acceptance of such models in a regulatory framework. The workshop aimed to benefit scientists working in academia, industry and regulatory agencies by sharing information and discussing future directions. The meeting provided a much-needed avenue to explore strategies to promote the adoption of these in vitro tools. We sincerely thank all participants in contributing to making the workshop a success, with particular thanks to Drs Adam Lillicrap (NIVA), Michelle Embry (ILSI HESI) and Julita Stadnicka (Eawag) for contributing presentations. Find out more about our use of animals in research at Plymouth University. Vicari T, Baron M, Maunder R, La Torre A, Rance G, Cestari M, Khlobystov A, Jha A.
Langan L, Owen S, Jackson S, Purcell W, Jha A. Morphological and metabolic characterisation of the rainbow trout intestine grown in vitro with a specific focus on the pyloric. Platform presentation, SETAC World congress meeting, Orlando, Florida, USA, November 2017. Non-destructive technique measures oxygen levels in 3D cells used for toxicity testing. Plymouth University Press Release; 22 Feb 2016. Direct Measurements of Oxygen Gradients in Spheroid Culture System Using Electron Parametric Resonance Oximetry; Paperity, Feb 2016. Innovative Method Measures O2 levels in 3D Cells Used for Tox Testing; Genetic Engineering and Biotechnology News (GEN); Feb 2016. Technique measures oxygen levels in 3D cells used for toxicity testing; Plymouth Daily, 24 Feb 2016. Virtual fish will save the lives of millions of lab animals; The Herald, March, 2014. University project could reduce vivisection; The Herald, July 2012.